Most primary evidence for the uniform of the eight Line Battalions is for the later period. As it was modelled closely on that of the British infantry, it does not present too many problems, though some elements can still use clarification. Sources mentioned below are described on page 1 if not otherwise referenced. Click to enlarge images. The button arrangements here are for a battalion or grenadier company jacket: the 14 small or “breast” buttons comprise 10 for the front, two for the shoulder straps and one to fasten each pocket flap. The 18 large buttons are four for each cuff and pocket, and two on the skirts. On light company jackets the usual practice was for all buttons to be of the smaller size. However, the two Castell images in Beamish show the jacket lace as singly spaced. This passes, a bit ambiguously, into Knötel’s plate and from there into some more modern versions. This is in error: the Beamish Centrepiece of 1839 includes two Line Battalion figures, a grenadier and a light company skirmisher; these detailed models both show the laces as clearly in pairs. In addition to this, all three surviving NCO jackets at Celle have double spacing, the Pearse notebook clearly states “10 by 2”, and both the Johann Klein image and the Hamilton Smith chart confirm this. As for the lace, von Pivka alone maintains that it was plain white, citing the Celle jackets. However, this overlooks that the Celle jackets are laced white because they are for sergeants. The sample in the Pearse notebook has a central dark blue “worm”, and most primary sources correctly portray this. All primary sources show a lace edging to the collar. Unusually, the grenadier and battalion company sergeants’ jackets at Celle both have slanting (“slash”) pockets, the standard style for the light company – unless in the Legion this was a distinction on all sergeants’ jackets or even on all jackets? Interestingly, the Klein watercolour also shows a slash pocket on the jacket of a battalion company man. The same figure also shows a lace diamond between the buttons above the rear skirts instead of the usual triangle or “hat”; initially I took this for a mistake, but in a few cases tailors’ books of the time do specify a lace diamond or “double triangle”, so this may well be correct. Alone of the primary sources, the Hamilton Smith plate shows wings and turnbacks in the facing colour of dark blue. This feature passes into Knötel and Aerts and is reckoned a mistake by modern commentators; probably so, though it is such a specific mistake by a normally reliable witness that one wonders if there was once some basis for it. The flank company turnback ornaments and slightly unusual wings on the Celle jackets are documented in Chappell and elsewhere. 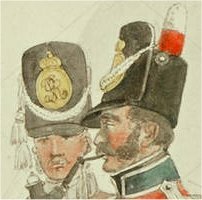 The Klein sketch shows the 1812 cap worn in 1815 with a crowned oval plate with border containing the royal cipher alone, without the additional oval garter and battalion number found in the conventionally shaped plates at Celle. Though this detail seems to be drawn with deliberation, without supporting evidence it may have to be considered as loose reporting by the artist. The diary of Ensign Edmund Wheatley of the 5th Battalion (The Wheatley Diary, ed Christopher Hibbert, Windrush Press, 1997) contains a rough sketch made in October 1813 of his men at a camp fire. With their grey trousers they wear whitish undress jackets with red collars and cuffs, and red forage caps, the flat tops tilted to one side. The tops appear possibly to be edged in braid or cord, possibly white, and similarly divided into sections, maybe quarters. Mike Chappell reconstructs these in a more orthodox “muffin” shape, the tops divided into six, with a white tassel. How far the slight original sketch justifies this shape and level of detail, it’s hard to say. Mike Chappell states firmly that the KGL’s greatcoats were made without capes, and draws a single breasted, five button garment, but I’m ignorant of the basis for this. If it’s the “Wellington” coat (see page 1), that has to be discounted as an impostor. A sketch of a fellow officer in the Wheatley diary could perhaps be taken to back this, but it is extremely vague, head and shoulders only, and it is of an officer. I’m not aware of any reason why the KGL’s greatcoats should have differed from the standard pattern. Given the arcane and confusing complexities of drummers’ lacing, this is less detailed than we might hope for. A sample of KGL drummer’s “broad” (or “double”) lace is pasted into the Pearse book, of a pattern with dark blue and white alternate chevrons. The sample of “narrow” (or “binding”) lace is now missing, but this would have been equivalent to one half of the broad pattern, so of blue and white diagonal bars. The notes call for broad and narrow drummer’s lace only, not requiring any “looping” lace of the private’s pattern. The last entry shows that broad lace was used on the seams (one back, two side and two on each sleeve), the “frames” or edges of the pockets, and around the top edges of the cuffs. The 15 yards allowance of narrow drummer’s lace was used for the same elements as on a private’s jacket (loops on the front, on cuffs and on pockets, and edging to the collar), the extra three yards being enough for the lacing of a pair of wings. (Wings are not mentioned in the notes, but should be taken for granted.) Significantly, there is no mention of “darts”, the sleeve chevrons sometimes omitted from drummer’s jackets at this period. Without darts, the cuffs would have been round in form. No lace edging to the jacket or turnbacks is called for. The numbers and arrangement of buttons are the same as for the private’s jacket, but with two fewer small buttons. The “missing” pair has to be on the pockets; this may suggest that all drummers’ jackets, not just those of the light companies, were made with diagonal “slash” flaps, or more likely that the drummers’ jackets simply omitted the small button that fastened the pocket flap. My (very) rough sketch here of a reconstruction of the jacket may help to clarify all this. However, different versions are current among more recent illustrators: Hofschröer’s 1989 Osprey reproduces in black and white an Aerts painting at Celle of a light company bugler post 1812, in a jacket that has some similarities, but is laced throughout in the “narrow” lace, with edging to jacket and turnbacks, darts on the sleeves and two vertical lines of braid connecting the outer ends of the loops in a “front frame” (“body” or “breast” lace). Aerts’s album of watercolours at the Bibliothèque Nationale in Paris contains a similar version of this figure as a drummer, but with shoulder straps and tufts or fringe in place of wings. Unlike most of his images of the Legion, these are not derived from Beamish or Knötel, and I do not know what the original source might be, unless of course they represent educated guesswork. Von Pivka copies the Aerts bugler directly in one of his plates. More recently, Mike Chappell’s plates include a drummer of 1805 and a light company bugler of 1815. Both wear jackets laced with what appears to be a “royal” pattern of drummer’s lace, and both have sleeves with darts. These may be “corrected” developments of Aerts’s musicians; if not, I have no idea what their specific bases may be. The chief contradictions with the Pearse evidence are the inclusion of darts on the sleeves and the pattern of lace. Aerts’s drummer and bugler, with von Pivka’s copy: but what’s the origin of this? Chappell illustrates two bandsmen of 1815 “dressed in much the same manner as a bandsman of the Foot Guards”, in a gold laced version of the jacket, with gold laced and fringed wings, gold cap cords and white trouser stripes. I don’t know what the basis for this might be. Hofschröer’s 1989 Osprey reproduces in black and white an Aerts painting at Celle of a sergeant major of a line battalion. (This is ascribed to “an unknown artist”, but is clearly signed and dated by Aerts.) It includes a jacket in officer’s style with gold lace and chevrons, gold cap cords and gold trouser stripe. I’m not aware of any direct source for this, and unlike most of Aerts’s other images of the Legion, the figure is not borrowed directly from Beamish or Knötel, beyond making a reasonable extrapolation from Beamish’s images of officers. The jacket lace is shown as singly spaced on the breast, but double on the cuffs – an echo of the confusion on this point in officers’ dress originating in Beamish – see below. However, the most doubtful point to my mind is the gold trouser stripe. It looks like a fair guess, but only a guess. Von Pivka and Chappell borrow this figure directly from Aerts for their own plates, gold stripe and all. This seems to be the origin of the gold trouser stripes for officers shown by Chappell – see below. Primary sources here are relatively plentiful, but there is still room for some fresh considerations. The Celle officer’s coat: single buttons or pairs? The coat of an officer of a centre company of the 1st Battalion at Celle may have contributed to the early confusion over button spacing. Its rows of eight buttons do seem to be applied in pairs, but the difference between the spaces within and between pairs is fractional, so that, at a glance, the coat appears singly spaced. The Beamish image of a line battalion officer is similarly unclear, though the accompanying plate of an officer of line battalion skirmishers shows the buttons unambiguously in pairs. Knötel, Aerts and von Pivka perpetuate this confusion. However, double spacing is clearly indicated by the 5th Battalion jacket (at Hanover), the Hamilton Smith chart (above), a sketch by von Röder, the portrait of Captain Hartmann of the 2nd Battalion (National Army Museum) and the Ompteda portrait (at Celle), as well as by data in the tailors’ books and by the other ranks’ jackets. The Hartmann portrait, dated to 1815, shows the turned back lapels as relatively narrow, while the Ompteda portrait shows them cut unusually broad. The Celle coat and Beamish images of jackets show the lapels, when buttoned across, displaying a single row of gold lace loops down the buttons at the front edge; this would give thirty lace holes in all on the front of a ten button jacket. The Ompteda portrait alone shows a gold lace edging to the collar. The Celle coat has no lace on the pockets or skirts. The Meyer ledger (thanks to Meyer & Mortimer and Ben Townsend for images) contains orders for twelve coats (or materials for coats) between 1809 and August 1811 for officers of the 1st, 3rd, 4th and 5th Battalions. The bulk of these, where lacing is mentioned, have rows of ten buttons, though two are costed for eight or 16 “extra” loops, suggesting that these are coats for shorter men with eight buttons in four pairs. The allowance per coat of gold lace is 16 yards; since the total number of loops on a ten button coat with laced pockets would be 48 (front, lapels, collar, cuffs and pockets), the average length of loop, after deducting a few inches for the triangle on the rear skirts, would be a fraction under 12 inches per loop, or something under six inches when doubled. 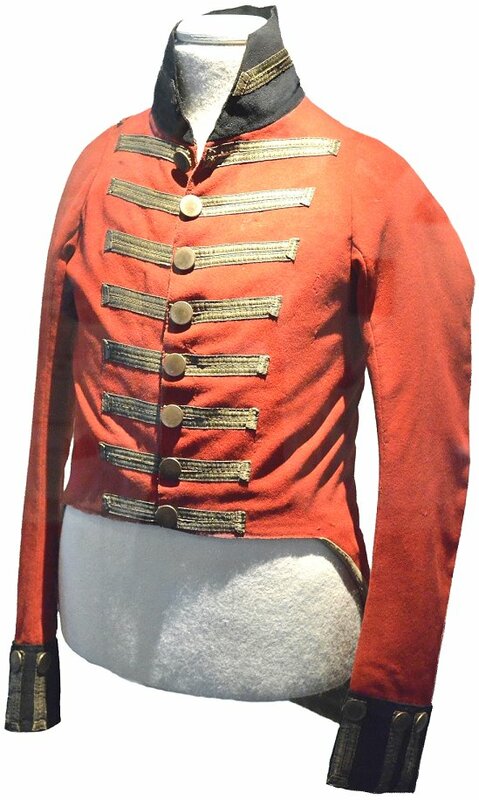 The Stothard tailor’s book entry for an officer’s jacket (above) is dated 1813, and is for the 1st battalion, but notes “All the 8 Battn made the same except the Buttons which his Numbred.” Here the lapels narrow visibly towards the waist. The button holes are specified as of gold vellum, a type of lace with lateral bars woven in relief. 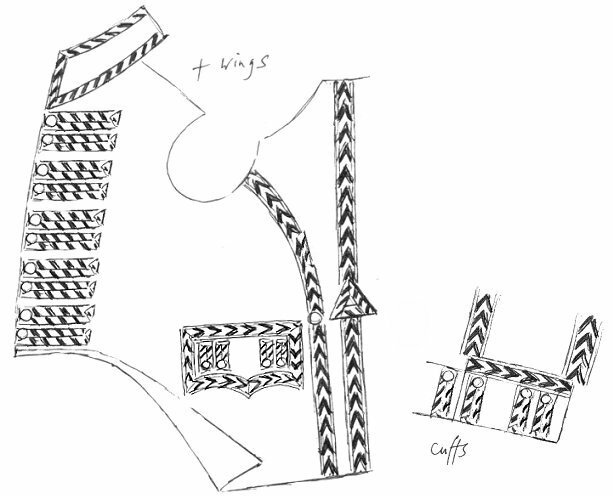 The appearance in the drawing of an edging to the white cassimere turnbacks has been corrected with the annotation “No Lace for the Turnbacks”, while a lozenge shaped skirt ornament is indicated, to be bought in along with the epaulettes; this is likely to be the “KGL” ornament as on the Celle coat, and as illustrated by Chappell. As on the Celle coat, the skirts here have no lace; unlike on the Celle coat, the jacket pockets are laced. Note, however, that there is no indication in Stothard’s text of the single row of gold lace loops on the scarlet front as noted above; buttoned over, the front would have appeared unlaced. Meyer’s allowance of buttons per coat is 38 large and three small. This matches the Stothard jacket drawing: 20 large buttons on the front, two for the collar, four for each cuff and pocket, total 38; two small on the rear skirts and one to hold a company officer’s epaulette, total three. The 5th Battalion jacket at Hanover Museum matches perfectly the Stothard drawing and Meyer details; its lapels have eight buttons and loops in four pairs. The Meyer ledger contains eight orders for waistcoats from officers of four battalions between 1810 and 1814. Of the three where any details are given, one is described as of white cassimere and “regimental”, one of blue cassimere with regimental buttons, and one blue and “laced”. Here “blue” would mean dark blue. The white and blue cassimere waistcoats were ordered in 1810 by the same ensign; no single pattern being obligatory, officers clearly chose from a range of appropriate styles. The Meyer ledger has orders for five pairs of pantaloons for officers of four battalions. Three are of blue stocking, two plain and one ornamented with braid, while a pair ordered in 1811 by the major of the 5th Battalion is of grey mixed milled cassimere. The ledger also has half a dozen orders for overalls, all from 1814, but these give few details, and are noted simply as cassimere, blue cloth or “Wellington”, by which I understand “mixed” grey. The two plates in Beamish of line battalion officers in grey trousers show no outer seam stripes, nor does a self portrait sketch in the Wheatley diary. In contrast, the von Röder watercolour of a centre company officer (though with a sabre on a black waist belt as for a light company) clearly shows a scarlet seam stripe. Knötel and other earlier secondary sources retain the plain grey trousers, but Chappell gives his officers gold lace trouser seam stripes, presumably on the basis of the Aerts image of a sergeant major discussed above as suspect in this regard; I can see no other source for this. The Meyer ledger contains orders for seven greatcoats for officers of the 1st to 5th Battalions from 1810 to 1814. One, for an ensign of the 2nd Battalion in 1814, is of mixed (grey) cloth; the other six, including two for other officers of the same battalion, are all of blue. These are the capeless dark blue officer’s undress top coat (“long pelisse” or “pelisse greatcoat”) that became increasingly fashionable during this period. Two of these coats, both of 1810, are specified as single breasted; one of these has cloth covered buttons. Judging by their pricing, the majority are plain, or very simply ornamented. However, one coat, for a captain of the 3rd battalion in 1811, is significantly more costly, and is ornamented with 34 yards of silk royal cord, 10 yards of narrow figuring braid and 51 silk “olives”, all probably in black. 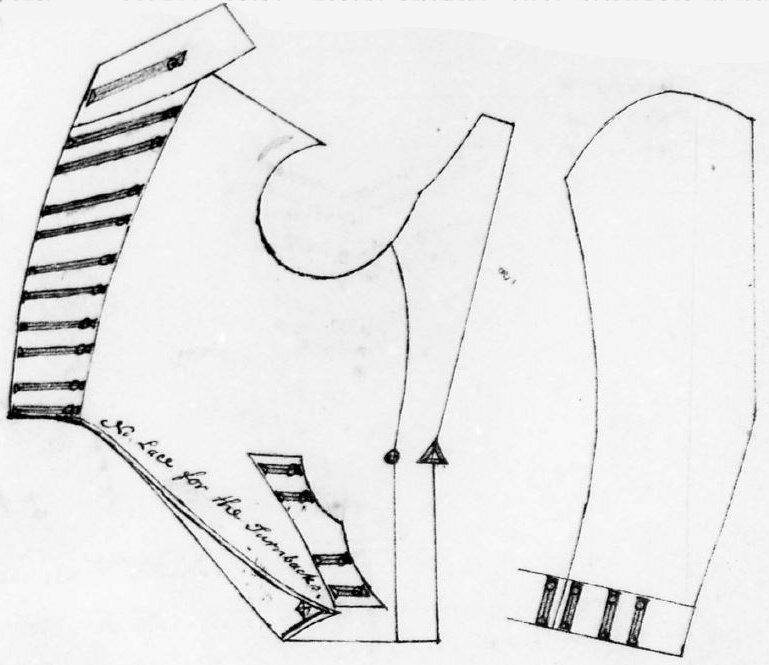 It’s impossible to be sure of the precise pattern, which would have been a matter of personal choice, but these quantities would allow at least for the coat to be edged in cord with, hypothetically, three rows of 17 olives on the front with cord loops (or maybe three rows of 15 plus three olives on each skirt or hip), and the collar and cuffs ornamented with figuring braid. “Boat cloaks” or “mantles” were commonly used by officers of the time, and the Meyer ledger includes orders for two military cloaks for officers of the 1st and 3rd Battalions, both in 1811. These are of dark blue camblet (or camlet, a wool-cotton mix) partly lined with scarlet “coating”, with a cape lined with dark blue shalloon. According to In the King’s German Legion: Memoirs of Baron Ompteda (London, 1894), as Colonel of the 5th Battalion in 1815 Ompteda spent a night “wrapped only in his blue cloak”. The jacket of Georg Gerson, Assistant Surgeon of the 5th Battalion from late 1811, is held by the Hamburg Museum. This follows the pattern of the battalion officer’s jacket, with dark blue facings, gold vellum lace loops and KGL officer’s turnback ornaments, but the front is single breasted, in staff style, with eight loops, singly spaced. Despite this, the double spacing of the battalion is kept on the pockets and cuffs – the last point not noticed by modern illustrators. The buttons are large, flat and plain, which raises the question of whether they are original to the jacket. A single gold epaulette would have been worn on the right shoulder of this jacket.